Your brand strategy states what you intend to deliver through your products and services, and differentiates what you offer to the market from what competitors offer. Research indicates that having a clear and concise brand strategy leads to stronger overall brand equity — how people feel about or perceive your product, and how much they are willing to pay for it. 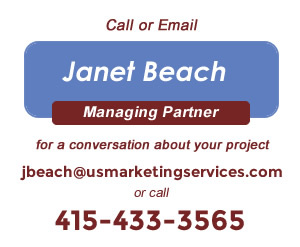 Your Brand Strategy work with US Marketing Services will be useful throughout your company in helping everyone, not just marketing and sales, to directly connect to customer needs, emotions, and influence competitive buying decisions. The clients we work with have unique strategic advantages – based on what they offer or produce and how they do business vs. competition. We have found that all companies can make improvements and we will work to help you leverage your brand advantages. You have articulated so clearly what I have been frustrated and trying to say is the brand advantage and message we ought to have for the company and yet I (CEO) was not able to say what you have just figured out .THANK YOU for being the one to get it right! Brand Strategy Challenges: Some clients don’t know enough about what prospects and customers really value nor understand nor stay in close touch with the shifting basis decision-makers use when they make buying decisions. It may be that you do not know enough about how your firm or products are perceived and the real value you offer – as seen and believed by your customers, prospects, expert advisors, and referral sources. Many firms do not use marketing and customer preference information to decide upon the priority for introducing new products, new services, extensions or features. Many companies have the very benefits that customers actually equate with an ideal brand in their category, but are not communicating these in their positioning and “messaging” so that prospects and customers will know, believe, and associate these ideal values to their brand. Some do not use brand strategy cross-functionally to deliver the benefits through the sales, customer service and R&D and talent acquisition implementations as well as in the marketing communications and the product management process.